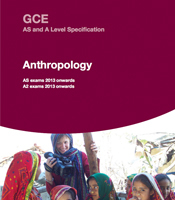 We are not developing a new A-level Anthropology qualification due to government changes to A-levels. As an alternative, you may like to consider our new AS and A-levels in History and Sociology, or our new AS and A-level in Archaeology, which we are planning to develop. Anthropology looks into why we function the way we do from biological, evolutionary, historical and social perspectives. Alongside this, it teaches students fundamental skills they need in the contemporary world and skills in critical analysis that can be carried forward to higher education. This course has been developed alongside the Royal Anthropological Institute (RAI). This specification is a four-unit course. It is assessed based on written examinations for each unit which contribute to 25% of the final A-level grade. The learning objectives, combined with emphasis on Quality of Written Communication, will ensure that students come out with the ability to apply their anthropological knowledge in a well-educated manner and use these skills for practical purposes. Last exams are in June 2018, with a final re-sit opportunity in June 2019.